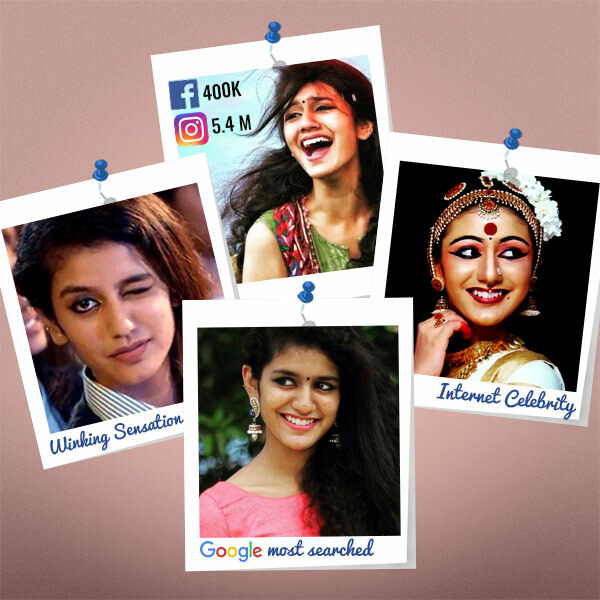 Meet Priya Prakash Varrier - The biggest newsmaker of 2018. 28 second audio clip from Manikya Malaraya Poovi – Oru Adaar Love, an upocming Malayalam film had released a single titled – Manikya Malaraya Poove online. While the song’s soulful lyrics struck a chord with the audience a 28 second audio clip clipped form the song was fast spreading online. It featured two actors as high school sweet hearts. They engaged in an unspoken romantic conversation that involved arching of eye brows, playing coy and winking! Fans on social media were declaring it the cutest love story! The one highlight that became a viral talking point was the girl’s flirtatious wink! Suddenly everyone wanted to know who she was. That’s when Priya Prakash Varrier, the inernet celebrity, also an upcoming actress was born! Priya Prakash Varrier – The upcoming debutante is an 18 student of B.Com who hails from Trissur, Kerala. She is also a trained Mohiniyattam dancer and sings like a dream! Like any one of us, she loves having fun on social media. The 18 year old aspiring artiste did not expect to create this kind of frenzy among the audience. With this phenomenon taking place days before Valentine’s Day, the effect was amplified. She was flooded with requests to be their Valentine on Facebook, She became the nation’s crush! And all this because of one wink! Social Media celebrity – Her followers on Instagram grew by 605k followers in one night! She almost beat Chritian Ronaldo and Kylie who also witnessed a an exponential increase in their followers in 24 hours! The to be actress now stands at 5.3 million followers on Insta! She has managed to race ahead of Dulquer Salmaan, Rana Daggubati and Anushka Shetty. Controversies: But with every viral topic, comes an equal share of controversies. Several complains were filed against Priya Prakash Varrier, the director and the songs on the grounds of allegedly hurting Muslim sentiments. An FIR was filed against Priya who sought to Supreme court to squash all complaints against her. There were reports that the song was asked to be pulled out. The Supreme Court then declared a stay on all proceedings against her. The Supreme Court also declared that no FIR would be filed against Priya Prakash Varrier and the film. As per the latest update, a fresh plea has been filed against Priya Prakash Varrier, stating Winking is forbidden in Islam. However no action has been taken on the same. #Oru Adaar Love became red hot in the trade market with everyone wanting a piece of it. #Her wink also received the trademark Amul touch. #Rumours about her Bollywood debut started to do the rounds. There were reports that she was signed up for Simmba opposite Ranveer Singh. The debutante will soon be seen in Oru Adaar love. Directed by Omar Lulu, the film is about high school romance. The movie is scheduled to release in June.